Need a great design for a light up t-shirt? Don’t have an image yet? No problem, let our creative design team create a unique, one of a kind, design that displays your idea on a brilliantly lit up t-shirt. Priced at a very affordable, discounted, $25 flat-price. Once you complete your check out and pay one of our design team members will contact you to go over your design. 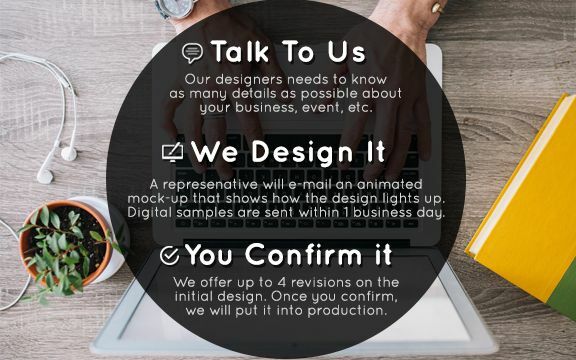 Once your design is finished you will receive an email with a link to the custom design and you will be able to see it animating. We will create your custom design from scratch within 2-3 business days. Once you review the design you will be able to choose the design or request additional revisions. Once you are satisfied with the design and mock up you can order your custom LED light up t-shirt! Feel free to send us any example images of design styles your interested in or a basic sketch of how you want it to look. These guys came up with a custom design for us that was beyond perfect! Couldn’t have been more pleased! I am incredibly satisfied with the design Flashion Statement came up with, looking forward to getting my shirt!